Taylor Swift is notorious for writing songs about her former flames, and her latest single would appear to be sticking to the formula. 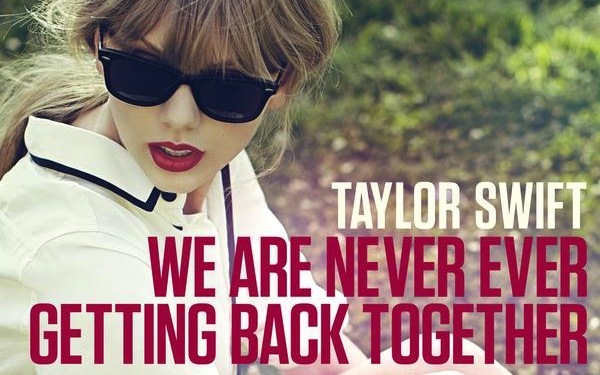 ‘We Are Never Ever Getting Back Together’ was released this week, and has already reached number one on the iTunes chart. Of Swift’s list of famous exes, the song can probably be narrowed down to two, with the lyrics “Hide away and find your peace of mind, with some indie record that’s much cooler than mine.” Swift has previously dated Joe Jonas, and John Mayer, and since Jonas isn’t really in the “indy” scene, we’re going to have to guess it’s another song about Mayer. What do you think of Swifty’s new song? And who do you think it’s about?